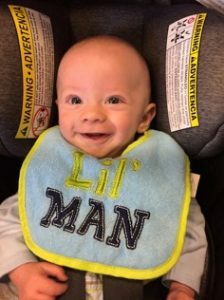 Jeb Hoffman’s parents didn’t expect their sweet son to be born premature, but he arrived early on October 20, 2016! Below, his mother, April, shares in her own words what it meant to stay at Ronald McDonald House Charities of Alabama while Jeb was one block away at Children’s of Alabama. On Monday October 17, 2016 I had a routine doctor’s appointment for my 32 week checkup with my obstetrician. Up until that day I had an uneventful pregnancy. The day ended in a whirlwind with me being transferred from our local hospital to UAB due to pregnancy complications. I was told the next morning that I would be on inpatient bed rest for 1-4 weeks until our son was born. On Wednesday morning my doctors decided it was unsafe to wait any longer and an induction would begin immediately. At 7:34 a.m. on Thursday, October 20 our son Jeb was born at 33 weeks and 2 days. 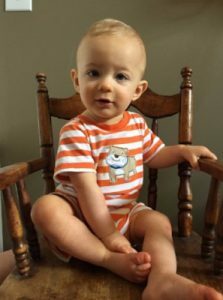 He weighed 3 pounds, 7 ounces and was taken straight to the neonatal intensive care unit (NICU). My husband and I were visited later that afternoon by a hospital social worker to go over our lodging options once I was discharged. She explained all of the choices and we asked her to pursue a referral to the Ronald McDonald House. She explained that there was no guarantee we would be able to get in, that it all depended on the wait list. On Saturday morning my husband called the Ronald McDonald House to check on the list. The lady he spoke with told him to call back after lunch. I won’t ever forget him saying to me, “I think we are gonna get in. She had a smile in her voice.” Sure enough, when he called back that afternoon we had been accepted and my husband was able to get settled into the house that night. I was discharged the following Monday and went straight to the Ronald McDonald House. My first impressions were of the upbeat atmosphere and the caring and friendliness of the staff. 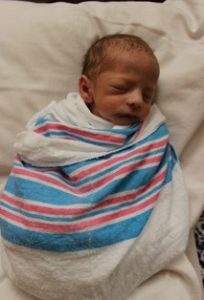 Our son spent five days in the NICU and then 13 days in Continuing Care Nursery before being discharged on Monday, November 7. My mother stayed with me the first week so my husband could go back to work and the second week I stayed by myself. That was the hardest time because I missed my family so much. The bright spots were the activities and staff at Ronald McDonald House. The staff was so good to ask how Jeb was doing and to make sure I was taking care of myself. I knew that if I had any needs they were available to help in any way they could. On the day Jeb was discharged I promised April [the Director of Family Programming] we would come back before we left town so the staff could meet him. When we got back to the House we only stayed for a few minutes because we were anxious to start our journey home and the staff was helping a new family get settled in. We were so blessed to have a place to stay during those two weeks and two days that was so close to the hospital. It allowed us to spend lots of time with our new baby. 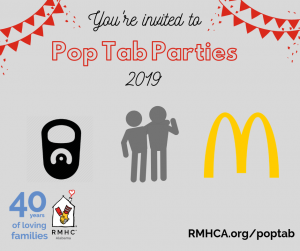 I know that there are many, many families that stay at the Ronald McDonald House for far longer than we did and we may not be remembered in the long run but my husband and I will never forget the blessings we received by being a Ronald McDonald House family. 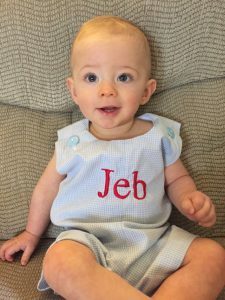 Now, Jeb is growing and doing great. He’s on baby food and it makes him seem so much older! I look forward to the day Jeb is old enough to understand why the Ronald McDonald House is such a big part of the story of when he was born. Jay, April & Jeb Hoffman. Please help us continue providing comfort and care for families like the Hoffmans! Your time and talents as a volunteer and financial support help keep 41 families near their children when they are sick or ill.